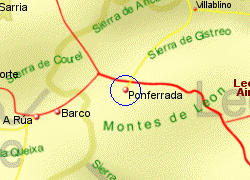 The ancient town of Ponferrada lies in the El Bierzo valley at an altitude of approximately 540m (1750 ft), in an area surrounded by mountains which rise to over 2000m, at the confluence of the rivers Sil and Boeza. 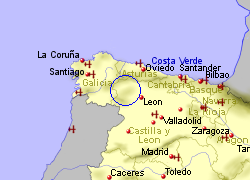 The town, which is overlooked by the imposing castle (Castillo de los Templarios) dating from the 13th century (covering an area of over 1.5Ha or 4 acres), lies on the Camino de Santiago, the pilgrims route that runs from France to Santiago de Compostela. Other buildings of interest include the Basilica de la Encina, built in the 16th and 17th centuries. The main industries today are agriculture and tourism, although in Roman times and upto the late 20th century, metals were mined in the area, including gold. 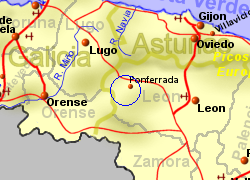 Map of the Ponferrada area.